Appearance: Xias was never overly concerned with his appearance, which is apparent in his personal hygiene. His hair is short, course, a sandy brown color, much like the hair of his otter form, and is typically in tangled mess, with the top flattened against his head. His eyes are dark brown, dark enough that his pupil is often indistinguishable from his iris. 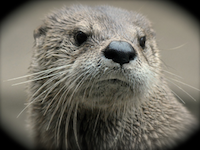 In proportion to the rest of his face, his eyes are fairly small and his mouth, which is often curled into a cheeky smile, is quite large- both traits are similar to his otter counterpart. His complexion is on the darker side of what would still be considered “white” and the features of his face would have most people guessing his age in human years was about 19. He stands 5’ 10”, with a fairly skinny, but athletic build, weighing around 150 lbs. His posture is quite good, he rarely slouches and typically stands to the peak of his height, reflective of his high level of confidence. His gait, however, is not as graceful and is typically clumsy and careless, but only on land. In the water, he is a fast and smooth swimmer. As an otter, Xias is about 2.5 feet long, including his tail, and weighs around 25 lbs, making him a fairly small, slender otter. His sandy brown fur on the top of his body is nearly identical to the color of his human-self’s hair, but on the under side it is significantly paler. His eyes might be considered large for an otter and are the same color of his human eyes. On the top of his head, slightly to the left of the center of his skull, is a thin scar, roughly one inch long. This scar, while typically hidden under a shaggy head of hair in his human form, is fairly obvious as an otter. If his mother was asked to describe Xias, she would probably use words like “kind-hearted”, “impulsive”, and “curious,” which are certainly accurate descriptions of him. If Xias was asked to describe himself, he would probably tilt his head in confusion, ask “why”, tell you to decide these things for yourself, and then find the entire conversation boring and precede to find some water to escape to. “Impulsive” would have to be Xias’ most defining characteristic. The moment he gets an idea, he will never plan nor think it over, only immediately execute it. This partially stems from his lack of focus, and from his playful attitude. Yet, even though his impulsiveness has gotten him into trouble more often than not (one example: his head scar), he remains confident that his decisions are always correct and will never change his mind once he gets an idea. The combination of his curiosity and his impulsiveness often makes him very friendly, as he cares very little about making any specific impression of himself, he is often more interested in learning what other people have to tell him. As a result, people tend to either find him to be a good listener and quite kind, or terribly annoying and overly nosey. Xias was born on a boat, and on that boat he spent most of his life. His mother, a Kelvic horse, was bonded to the captain of a merchant ship. His father was rarely mentioned, but as far as Xias could figure out, he was probably some charming Kelvic bird or something who was traveling with a crewmember for a short time. He spent his early days traveling between ports on the ship, and learning quite a lot about sea faring from the captain, who was a kind of father to him. His mother and the captain would try anything to keep his attention on the long voyages between port cities, just to keep him away from the more ornery crewmembers, particularly the first mate, who had issued them several warnings about what would happen to Xias if they didn’t keep him away. They found Xias could be distracted, at least for a while, by fishing, cooking, and especially swimming, so he got reasonably good at these skills. He also spent a great deal of time playing, in his otter form, with the first mate’s dog. So he spent his time practicing his skills, bothering the crewmembers, helping on the ship whenever he could, but mostly finding everything to be just a bit empty. He felt unfulfilled, as if this life wasn’t meant for him, as if he would never be able to find what he needed if he stayed on this ship. So, one day, as the ship prepared to leave port in Riverfall, he made an impulsive decision to gather all of his belongings, which he had managed to acquire from the quite generous wage the captain had provided him with, and just spend some time there. Perhaps the sneaking was unnecessary, his mother would have probably understood and allowed him to leave, but, she definitely wouldn’t have let him steal the first mate’s dog when he did, and, well, screw that guy. Cotton, black, baggy and reach the ground. Heirloom: Companion dog; Name: Crawdad – A light brown colored mutt with wiry hair. Stands 2 feet tall to the shoulders, and weighs 40 pounds. House: 1 large tent (4 person), large tarp, 100 ft of rope, flint & steel, lantern, 2 torches, bedroll, blanket, fishing tackle & hooks. Last edited by Xias on January 8th, 2018, 4:16 pm, edited 1 time in total.